I don't speak Portuguese, so I used machine translation to read this wonderful article (I know, I know, the irony is not lost on me). It is therefore likely that I didn't understand all the information as intended, and especially the subtleties and nuances that often make all the difference, so I apologize in advance if any of my comments are out of context or place. 1) As far as I know, VMware Fusion allows copying and pasting between the host (OS X) and guest (Windows) systems. Maybe a setting should be invoked? 2) As a free alternative I suggest having a look at VirtualBox. Its Seamless Mode similar to the way Parallels and VMware Fusion integrates the guest system into OS X - not as elegant and seamless perhaps, but not bad either. The first thing I'd be interested to know, of course, is if the dictation works with VirtualBox. 3) Because everything works well on MacBook Air there is no real need to venture further, but for educational purposes it would be interested to test how this works in a MacBook Pro/iMac with a quad core processor and at least 16GB of RAM. Either way, kudos for Apple for integrating the support for many new languages into the OS. I wonder if Windows 10 with its Cortana component marks the beginning of a change on the Windows side. I'm also curious to know when, if at all, more languages will find their way into the official desktop version of DNS. I'm also curious to see how the landscape of the translation environment tools will change over the course of the next five years or so. If .Net will become a reliable cross-platform infrastructure, this could mean an even more tighter integration. Thank you Tiago and Kevin for this interesting article. Thanks for the compliment, Shae. All three VM apps - VirtualBox, Parallels and VMWare allow for shared clipboards, the settings for which can be found in the Preferences/Settings panel for each application. What Parallels does better than the others is to actually use a sort of "alias" scheme to allow you to access the VM contents from within Yosemite and vice-versa. Sadly, VirtualBox (which served me faithfully for nearly two years) seems not to allow the call to the Dictation app. I could never get the keystroke combination to work with it. It's a shame, because VirtualBox is both good and free. Thank you Tiago. I suspected that much about VirtualBox. It would perhaps be a good idea to report this issue in their forums. I don't use OS X (it never was really an option because historically MacOS didn't play nice with Hebrew, even in the written form, so there was really no point insisting - but I hear changes are supposed to come in this department as well) so except for playing around with it here and there, I lack a more in-depth perceptive. But my impression was always that Parallels is the most balanced and seamless way to go about this type of virtualization in MacOS. I imagine that you can use shared folders in VirtualBox and VMplayer/Fusion to achieve a two-way data sharing, but it is probably not as convenient or trivial to set up compared to Parallels. Kevin, your research into dictation and its practical application is, and will be, invaluable. Now that we are one step closer to dictation for (almost) all major languages, and further steps are on the horizon, the discourse will probably become more pragmatic. Indeed, some people will not care for dictation, and some probably really do prefer typing. That's fine. Dictation should not become the new MpT with everyone who doesn't see its value or care for it automatically pegged as a Luddite. I think that the benefits of dictation speak (pun intended) for themselves, and when more material and real-world examples will be available, people will start realizing how they can fit it into their workflow. For me, dictation is just another tool in my toolbox. It just happens to be the one that works really well with all the others, all for my convenience. To be radically against MpT or speech recognition is just denying oneself the chance of: a) learning for yourself if there are any merits to said tool, and what merits are those; b) to professionally develop oneself, due to this learning experience; c) actually have a better return from the time one spends working. Somethings work, somethings don't. Some work rather well, others not at all. For me, this works rather well, along with my little bag of tricks I picked up over the years. I'd encourage people to try it and evaluate it. I didn't warm up to it on my first attempt (I think Kevin has a video of me failing miserably at dictating in Portuguese), but the problem was actually with the way I talked. One thing dictation does do, apart from the ergonomic benefits, is to actually improve the clarity of your speech. It is just a tool... but it's a tool with which a properly experienced and skilled translator can produce a (closely proofread) 3000 word translation in about 2 hrs. Another update: If you are in any way tied to academia, you can get Parallels for 50% the regular price. 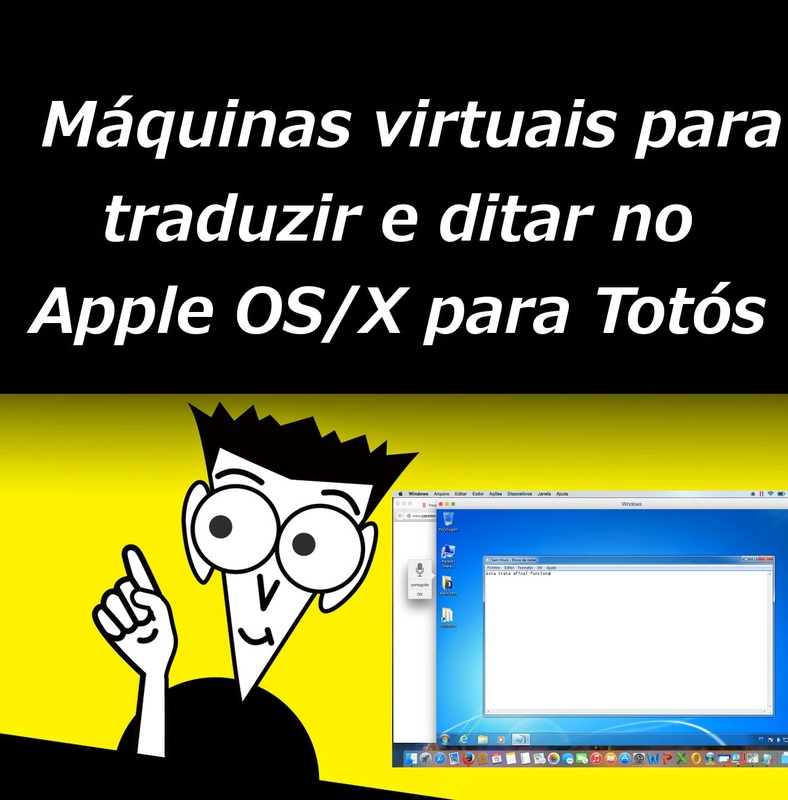 I'm actually convinced that there is no reason to use virtualisation for a freelance translator, there are very good CAT tools for Mac that don't require Parallels or Fusion. You can handle Studio, Transit and memoQ projects on your Mac. You will have to use Java, but this is a small 'price' compared to using Windows, in my opinion.